There are a lot of Italy locations which did not make the list such as Genoa, Bari, Naples, Bologna and Pompeii. In addition there are lots of Instagrammable coastal destinations around the country. Also Italy has more UNESCO sites than any other country. Rome is the capital city of Italy as well as the most visited. When you think of Italy and ‘what is the iconic landmark of Italy?’, the answer is usually the Colosseum. You should walk around the Colosseum as you can photograph it from many different angles. It’s possible to photograph it with greenery in the foreground and also with ancient Rome in the foreground. I went for the long exposure shot during blue hour with moving car lights. In addition to photographing the Colosseum, there are many other Instagrammable locations in Rome. Of course you must make a visit to Vatican City to see the largest cathedral in the world and several masterpieces by Michelangelo. Rome is definitely one of the best locations in Italy. Whilst visiting Venice I took a boat out to Burano. I was rewarded with perfect reflections of the colourful houses alongside the canals. Venice is regarded as one of the most romantic cities in the world. The typical Instagrammable shot in Venice is taken whilst on a Gondola ride through the canals. In Venice there are unique bridges, Venetian buildings, canals, plazas as well as religious buildings. You’ll have no problem finding beautiful locations to photograph. However, a short boat ride away is the ultimate Instagram worth location in Venice, Burano. Burano offers brightly colored houses and calm canal waters. This guarantees you can make perfect reflection shots of these colorful houses. Colorful houses in addition to reflections, guarantees lots of likes! A bonus is you can take lots of Venice pictures from the boat on the way to Burano. Milan is the second most visited city in Italy, after Rome. The Instagrammable Italy location in Milan is Milan Cathedral. This is locally known as the Duomo. It’s the largest church in Italy and the third largest in the world. The huge square in front of Milan Cathedral is popular with those who like to make Instagram poses. Another Instagrammable location in Milan is in the Galleria Vittorio Emanuele II shopping mall adjacent to the Duomo. Florence is the 5th most visited city in Italy. Similarly to Milan, the Instagrammable building in Florence is Florence Cathedral. The best place to photograph the Duomo from is Michelangelo plaza. From here you can see Florence Cathedral dominating the Florence skyline. Another notable location in Florence for photography is Ponte Vecchio reflecting in the Arno river. Cinque Terre is a set of 5 villages. It’s similar to Burano, Venice because there are many colorful houses. The difference with Cinque Terre is that there are no canals. Instead the colorful houses are built up on cliff edges. All 5 villages offer wonder photo opportunities but the money shot is taken from a viewpoint in Manarola (above). You can easily visit Cinque Terre on a day trip from Florence. Turin is not one of the most visited of Italy locations, but it should be. Via Roma is the main pedestrian street of the city. I was lucky enough to have bad weather, this ensured the road was clear as well as giving an Instagrammable reflection. On a summers day my Instagram shot would be unrecognizable. Another Instagrammable location in Turin is the viewpoint from Monte dei Cappuccini. From Monte dei Cappuccini there is a panoramic view of the city with the Italian Alps in the distance. The Leaning Tower of Pisa is one of the iconic landmarks of Italy. In front of the tower you’ll see hundreds of people making Instagram poses. The Instagram pose is where they create the optical illusion that they are stopping the tower from falling (I have one too!). Additionally, you can take a walk to the Arno river, this gives a perfect reflection of the colorful houses of Pisa. You can visit Pisa on a day trip from Florence. @centropaolovibrescia is a hotel located in a palace in Brescia. Brescia is home to 2 UNESCO world heritage sites. You can make day trips to Verona, Lake Garda and Milan from Brescia which makes @centropaolovibrescia the perfect base for your stay in Italy. Centro Paolo VI is a Baroque palace located in the less visited Italian city of Brescia. You would imagine that staying in a palace is expensive but because of its location in Brescia, it’s cheaper than a regular hotel in Milan. In addition you can make day trips to Milan, Lake Garda as well as Verona. There are many Instagrammable locations in the palace, in fact you could spend days just exploring the interior. There’s even a private church located in the grounds! If you do make a trip to Verona, you can also make an Instagram pose on Juliet’s balcony. Whilst staying @victoriahoteltrieste in Trieste, Italy, I took a short trip to the Instagrammable Miramare Castle. Trieste is probably the least visited of Italy locations on the list. In fact many people think Trieste is part of Slovenia. Trieste is part of Italy and is home of the Miramare Castle. There’s something enchanting about a castle on the sea, for this reason it’s a Instagrammable location. In addition you can reach Trieste on a short train ride from Venice. San Marino is an independent country located in mainland Italy. You could in fact, describe San Marino as a mountain in Italy. For this reason I’ve included San Marino as an Instagrammable location in Italy. The capital of San Marino is San Marino city. This is a walled city which features 3 towers. A photo of a tower with a panoramic of Italy in the background guarantees likes on Instagram! 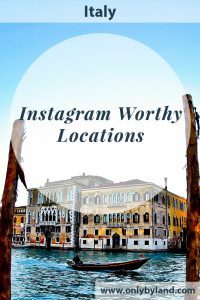 Be sure to check out the map of Italy so you can see where these Instagrammable locations are. I traveled around Italy with Flixbus, as well as the reliable intercity train. Read about the Portugal locations for Instagram photography.